HODIE 3a vice lecta est Billa, for the Keepers of Ale-houses and Tippling Houses to be bound by Recognizance, que communi omnium Procerum Assensu conclusa est. Eodem die, 1a vice lecta est Billa, That no Man shall put away his Wife and marry again, not being lawfully divorced by competent Judges. Eodem die, 1a vice lecta est nova Billa, That no Spiritual Person shall incurr into the Damages of Premunire for executing his Office, unless he shall proceed, being forbidden by the King's Writ of Prohibition. 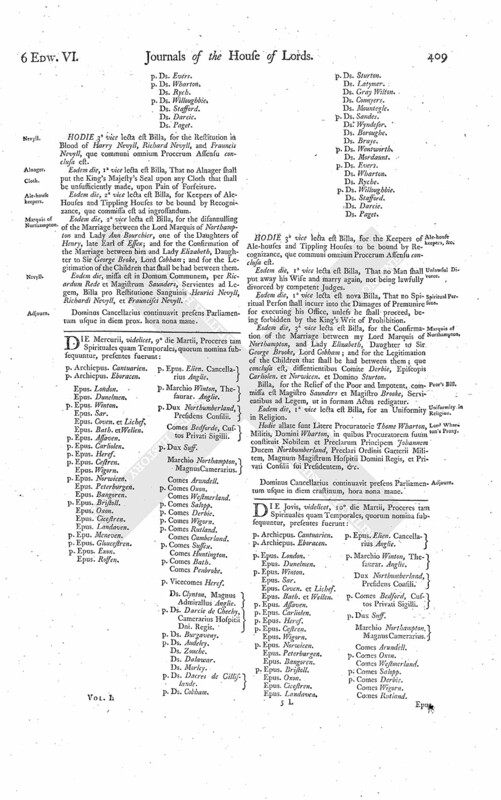 Eodem die, 3a vice lecta est Billa, for the Confirmation of the Marriage between my Lord Marquis of Northampton, and Lady Elizabeth, Daughter to Sir George Brooke, Lord Cobham; and for the Legitimation of the Children that shall be had between them; que conclusa est, dissentientibus Comite Derbie, Episcopis Carliolen. et Norwicen. et Domino Sturton. Billa, for the Relief of the Poor and Impotent, commissa est Magistro Saunders et Magistro Brooke, Servientibus ad Legem, ut in formam Actus redigatur. Eodem die, 1a vice lecta est Billa, for an Uniformity in Religion. Hodie allate sunt Litere Procuratorie Thome Wharton, Militis, Domini Wharton, in quibus Procuratorem suum constituit Nobilem et Preclarum Principem Johannem Ducem Northumberland, Preclari Ordinis Garterii Militem, Magnum Magistrum Hospitii Domini Regis, et Privati Consilii sui Presidentem, &c.
Dominus Cancellarius continuavit presens Parliamentum usque in diem crastimum, hora nona mane.